This is Automatic Side Loading Rewinder machine is used for wind & unwind laminated rolls, paper rolls etc with high speed, efficiency and accuracy. - Laminate Rolls, Paper Rolls, LD Rolls. HDPE woven sack rewinding machine complete with folding system pnumatic lifter nip roll assembly etc. We are a unique name in the market to provide our respected customers an exclusive range of Automatic Rewinding Machine. 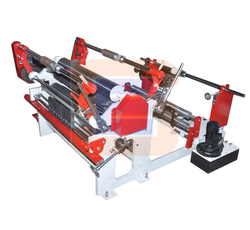 Leveraging on our extensive market knowledge, we are providing a high quality range of Automatic Roll Rewinder Machine. We have gained recognition as an eminent enterprise, devotedly engaged in manufacturing a broad range of Automatic Rewinding Machine.